Go Explore Someone Else’s Backyard! Now that summer is here and school is calm I have had a lot more time to explore. I’ve explored areas of Reno and Tahoe that I hadn’t been to, and I’ve explored activities that I hadn’t done yet (see blog on the RTO here). What I have enjoyed exploring the most though are areas that aren’t familiar to me, other people’s backyards. Ok, so not other people’s backyards in a literal sense, but other places in this Reno/Tahoe area and country that I haven’t explored yet. I’ve gone down to Southern California in the last week exploring hot springs, beaches and other areas. First, we camped at a natural hot spring in Bishop, California. The campground was exactly what we needed in order to car camp one night and get on the road down to Southern California the next day. We explored dirt roads and trails outside of the campground and found a little natural made hot spring pool. It was a neat and kind of gross experience. We were sitting in the hot spring enjoying a couple of beers when we noticed little red worms crawling all over us, so we were quick to finish our drinks and get out of there. However, I wouldn’t trade the experience exploring the area with my girlfriend, and we got to see the full moon rising over the red mountains in the area, it was pretty amazing. The camping trip was totally spur the moment, we had decided the night before to stop halfway through the drive and camp outside Bishop. This trip, that was whipped up in no time turned out to be quite the experience. It reminds me that it’s not always the destination that matters but the adventure along the way. Don’t get me wrong, the destination was absolutely perfect, we went to Huntington Beach and eventually Disneyland. The adventure to get there though was memorable as well. Go explore a place you have yet to experience, come back here and tell me how it was! This entry was posted in Lake Tahoe, Mindfulness and tagged Experience, explore, get outside, Lake Tahoe, Outdoors on June 5, 2013 by joshvega. Golf is a sport that’s increasing in popularity and is also a great way to get outside and see the natural beauty around us. I didn’t grow up golfing, but I got into it in high school. Golf is one of the most challenging sports out there because it requires excellent muscle memory as well as mental strength and endurance. The greatest golfers can start out playing great and end up totally messing up their round because of the mental aspect of the game. The nice thing about the game of golf is that if you are beginning there is minimal equipment needed. Golf clubs and some nicer clothes are all you need. The cost of a round of golf can be pricey, but if you take advantage of “twilight hours” it can be affordable. Used golf clubs can be found at thrift stores, used sports equipment stores, and on Craigslist. There are some great courses in the Reno Tahoe area that offer easier and more challenging courses. Carson Valley golf course in south Gardnerville is a great course to learn on. It is a little less challenging and it is also cheaper. 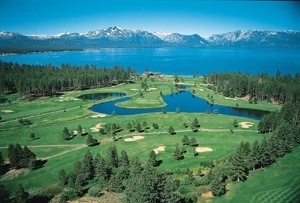 Edgewood in South Lake Tahoe is one of the most beautiful courses. It is located along the lake shore for part of the course. Edgewood is more challenging and also more expensive, but the beauty of the lake is definitely worth it. Genoa lakes is my favorite golf course. I worked there for 2 summers so I am a little bias but in my honest opinion it offers everything. 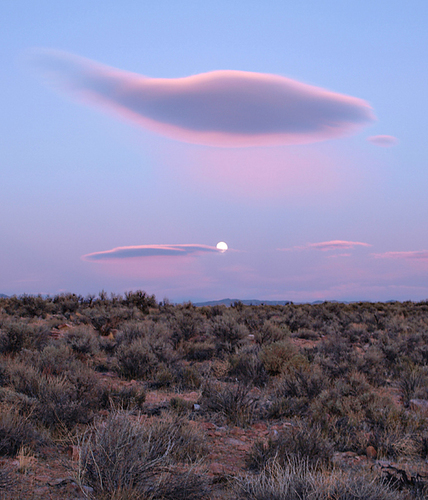 There are beautiful views of the Sierra Nevada mountains and Carson Valley. The course is also challenging and the price is competitive. If you are not a golfer I challenge to go and play once. It is a great sport to learn and is a lot of fun! You may get frustrated if you aren’t playing well but just remember that’s its just a sport and you’re out there to have fun. I bet that when you are having fun is when you’ll play your best. Where is your favorite course? If you don’t have a favorite, then why do you love golf? Please share! This entry was posted in Lake Tahoe, Uncategorized and tagged Activities, beautif, challenge, Golf, Lake Tahoe, Outdoors, sports on May 26, 2013 by joshvega. How many of you have sat staring at a landscape, or sunset, or award show and said to yourself “I’m going to remember this forever!” Think back on that moment, were you able to remember every detail of that moment that made it so special in the first place? I’ve been filming and compiling all the photos I have regarding my value. I can tell you that without these photos and videos I would not remember things like I had the first time I experienced them. At first I didn’t understand why so many people had go pros. It’s a tiny camera that you can use to film whatever you are doing. I thought that only cool, professional people were qualified to use them, people who were doing backflips and things of that nature. Who would want to watch themselves only go down a groomed ski run? But then I tried it. I am by no means a professional but I realized after watching my shots that not only do I enjoy watching myself do things but I was completely reliving that joy and experience. I felt like I was doing the action all over again. I would recommend everyone try it if you have the opportunity. I think it is important that everyone remember what they love. Our minds know what they love, but a lot of times they can’t paint the same picture the way we see it after the fact. I have relived so many memories from looking at the photos for this assignment. Take pictures and videos to remember these things years from now. That way, years from now when you can’t remember everything about that sunrise you watched with your girlfriend or boyfriend, a picture will remind you. This entry was posted in Uncategorized and tagged Lake Tahoe, memories, Outdoors, photo, picture on May 15, 2013 by joshvega. Outdoor Activity – Beach Day! Now that we are really getting into some heat in Reno and Tahoe there are not as many cool weather or winter activities. The ski season is just about over, as backcountry stashes are melting away, but there is so much to do in the summer that it isn’t bad news! The warm temperatures of course give us the opportunity to ride bikes, hike, run, and camp, but there is another activity that hot weather allows us to do. Ever since we could drive my friends and I would do beach days as much as possible. We loved driving up on the weekends and laying out in the sun, playing volleyball, swimming, and just being around our friends outside. The beach is a perfect place to do all these things. When it gets a little too hot for comfort you run down to the water, and dive in to the freezing lake. Then you jump up because the cold water has taken your breath away and run back to the shore, refreshed and feeling good. Our group of friends would stay up at Tahoe all day until it started getting dark. Then we’d come home, eat dinner, wake up and do it again the next day. When we were seniors in high school we had “early outs” so we would drive up to Zephyr Cove Beach during the week since it was 25 minutes away and hang out for the afternoon. We’d play doubles volleyball until the sun set and then stop for food on the way home. These are some of my favorite memories with my friends and being outside. I encourage you to find a local beach and make some memories. Or I challenge you to find a new spot you haven’t explored yet. Just last weekend I was able to go to a different, new beach in Tahoe with a group of friends. The weather was perfect, it was about 80 degrees and felt hot since it hasn’t been that warm yet this season. We played bocci ball, frisbee, hung out and just relaxed. 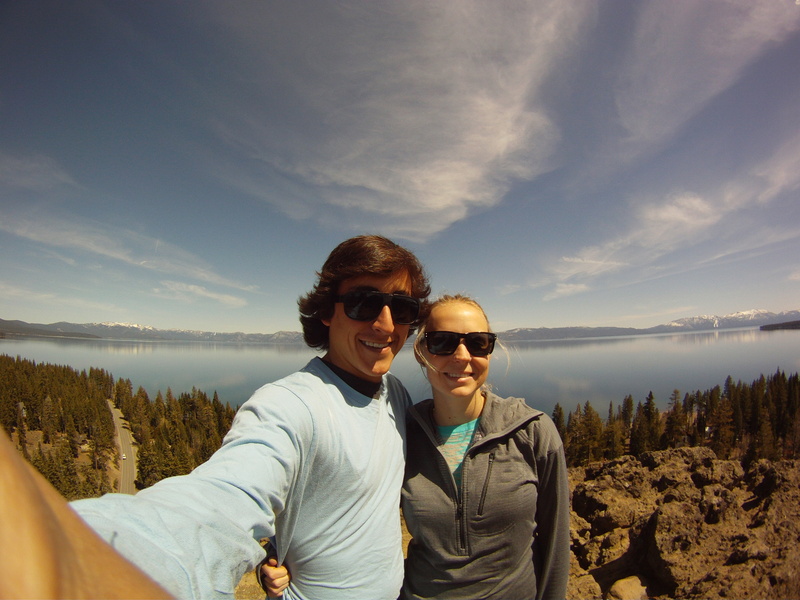 Not to mention, we were up in Tahoe, in one of the most beautiful places in the world. Could we be luckier? The water was freezing! There is still some snowmelt running into the lake so it was about 57 degrees. I don’t think I’ve felt the lake that cold in a LONG time. My girlfriend, Johanna wanted to jump off the dock so we went out there as a group. I jumped in, felt my breath leave me, and my muscles go numb as I paddled back toward the surface. I had just gotten out when she said “your shorts aren’t even wet!” and pushed me back in again. Double the freezing, but it was totally worth it because I have memories that will last forever and couldn’t imagine spending a day any other way. 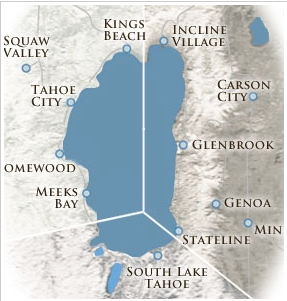 Get out there and share your favorite spots to hit the beach in the Reno/Tahoe area! Here’s a list of beaches to get you started. 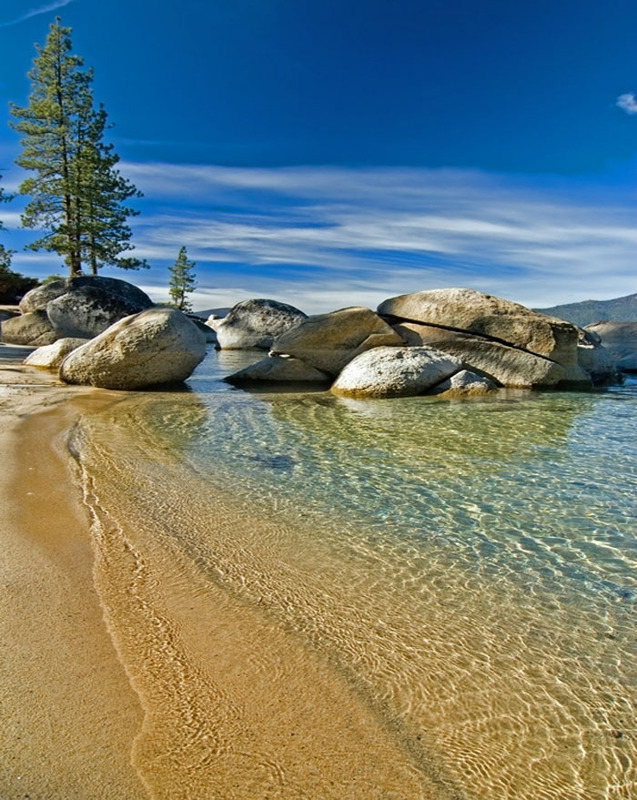 Here are some photos of beaches in Lake Tahoe if you need a little more motivation. This entry was posted in Uncategorized and tagged Activities, beach, lake, Lake Tahoe, Outdoors, summer, sun, Tahoe, water on May 14, 2013 by joshvega.